Manoa Falls is one of the most popular waterfalls on Oahu. 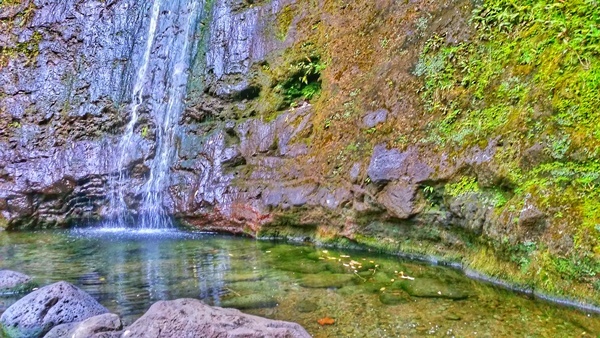 To reach these Oahu waterfalls, you’ll need to get there by foot. There is a hiking trail that will lead you there. 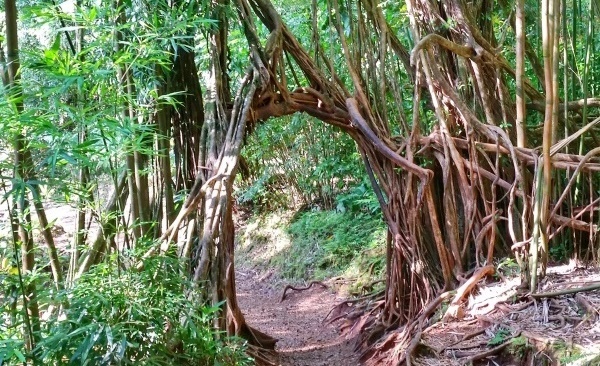 The Manoa Falls Trail will offer you a change in scenery from Waikiki and Honolulu. There’s an abundance and variety of plant life to take in as you make your way to the waterfalls. 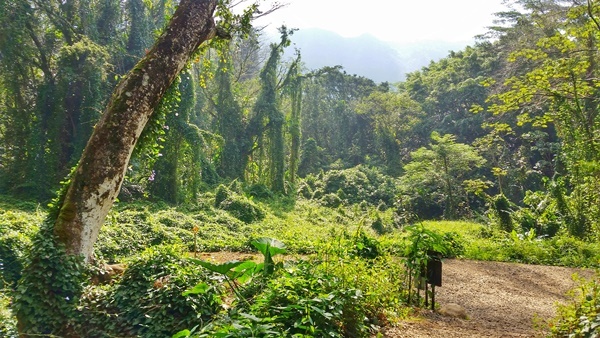 This is also an area that’s said to have been the filming location for a few scenes of several high profile shows, including Jurassic Park, Lost, and Hawaii Five-0! What can you find on the trail? Manoa Falls – the destination waterfalls! 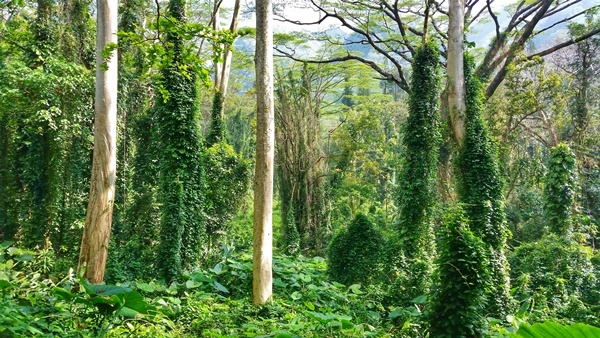 This is just some of what you can look forward to on the Manoa Falls Trail! The destination of the hike: Waterfalls! 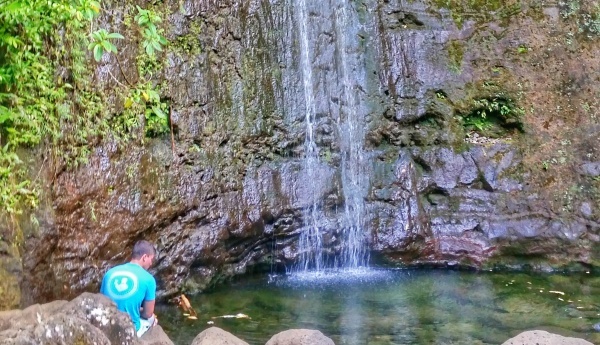 Can you go swimming at Manoa Falls? Swimming is technically off limits at these waterfalls. At the start of the trail, there’s a sign that tells you not to swim in the stream or waterfalls. On top of that, in order to reach the pond at the bottom of Manoa Falls, you’ll have to go into a roped off area. The reason there’s a danger sign up is because of the risk of falling rocks. That said, you will frequently find this sign ignored, and there are many hikers who go past the sign to the bottom of the waterfalls. If you choose to ignore the sign too, do so at your own risk! Another thing worth mentioning is that Hawaii is home to a dangerous bacteria that can be found in fresh water. This means that fresh water swimming is generally discouraged if you have open wounds. What’s the distance of this hiking trail? It’s a little under a mile to reach the waterfalls from the start of the trail, so it’s just under 2 miles round trip. How much time do you need to complete the trail? To hike this trail at a leisurely pace and enjoy your surroundings, consider giving yourself 1-2 hours to complete the trail. How far is Manoa Falls from Waikiki? These waterfalls are somewhat near Waikiki and Honolulu. It’s about 5 miles away. 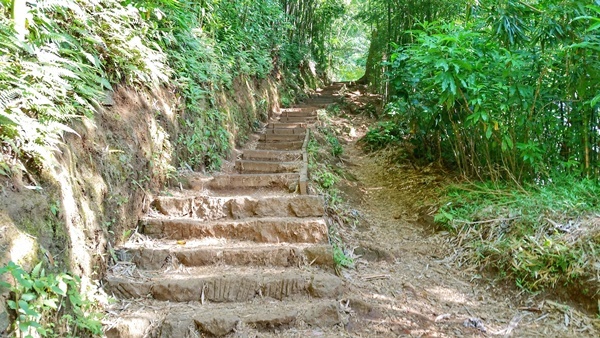 So, how to get to Manoa Falls? It’ll depend on where exactly in Waikiki or Honolulu you’re coming from. But if you have a car, it’ll likely take you 20-30 minutes to reach Manoa Falls Trail from Waikiki. Here’s more info about Manoa Falls parking and driving there. Once again, it will depend on where you’re staying. But your time on the bus will likely be 20-30 minutes. This time doesn’t factor in the timing spent waiting for the bus, the wait time if you need a bus transfer, or the extra walking involved to the start of the trailhead. From the time you leave your hotel in Waikiki until the time you get to the start of the Manoa Falls Trail, it might be closer to an hour. Here’s more info about taking the bus to Manoa Falls. Hawaii can get hot. A hike to Manoa Falls means that you’ll be sweating. Maybe a lot. For any hike in Hawaii, even if you’re going to be on the trail for less than an hour, it’s always a very good idea to take water to make sure you stay well-hydrated and SAFE! 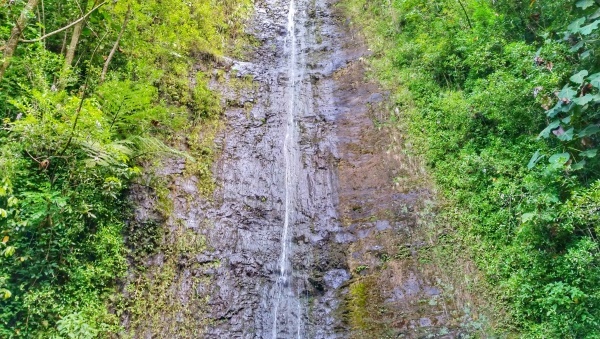 And since you will likely be on the Manoa Falls Trail for more than an hour, this means that you should really consider bringing along water! And here are some small backpacks to take a look at to pack along those extra snacks. Because snacks are also a very good idea when you’re hitting the trails in Hawaii. You may also want to have some extra socks too, as well as your sandals to change into after the hike, just in case you encounter a muddy trail. There are times that the Manoa Falls Trail can get a little muddy. HAPPY MANOA FALLS TRAIL HIKING!